Released Fall 1998, limited to current group members and alumni. Edited and Mastered at the Griffiths Music Lab by Jason Beerman ’99 and Brad Catton ’01. Manufactured and printed by Jason Beerman ’99 and Brad Catton ’01. Cover design: Paul Hughes ’00 and Brad Catton ’01. 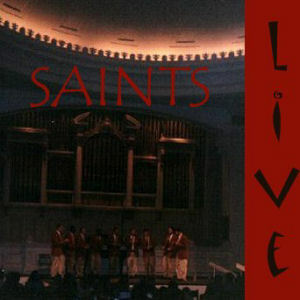 The Saints: Live! album was a collaborative project by then-outgoing and -incoming Saints Musical Directors Jason Beerman ’99 and Brad Catton ’01. It was produced as a final project for Alice Hessert’s “Sound and the Stage” class. Beerman and Brad went through the DAT tapes of Saints performances we had collected over the years and chose the best recordings to clean up and include in this album. This album includes some Saints songs that slipped through the cracks, never appearing on any other album, and some of these tracks are the only known recordings of particular songs, including Call and Answer, Wrap Your Arms Around Me, and The Moment I Saw Your Eyes. College Days and And So It Goes later appeared on the next Saints album, Yardwork! (1999).